I remember the time when I started work after graduation. I loved my job as a producer! A few years later, I felt restless. I wanted to intellectually stimulate my brain. What could I do? My father had never supported my educational aspirations. I have been struggling on my own since school days. The irony is that my father gave money, effort and words of encouragements to his 5 nieces and nephews (they are now millionaires, thanks to their wealthy late father) who don't even bother visiting my 84.5 year-old father, even on Hari Raya. But that is another story. Anyway, I wanted to go back to school. Take a break from work and study again. But study what? I heard there was this Masters of Strategic Studies course at the local university that sounded interesting. As I had studied political science, I thought it would be a good follow-up course to pursue. Plus the fees were not expensive. So, I called my professor to ask if he could write a good reference. He said, "Of course!" I happily completed the application form. One night, I had a dream. I dreamt that I was in a bus going to the university. Suddenly, the bus conductor accused me of not paying the fare and asked me to alight in the middle of the journey. I protested. But no one in the bus believed me. I had to walk around the extremely huge campus trying to find the department so that I could submit my documents. I asked people for directions but they were rude and weren't helpful. It was very frustrating. There were no discretional signs and buses in sight. I walked around for hours on end. It was scorching hot and I was drenched in perspiration. I wanted to rest for a while so I sat on the pavement by the roadside, tired and upset. A gentle breeze blew past me. I smiled, thankful for the short respite. As though I was bewitched, my eyes 'followed' the breeze and looked up at the bluest sky above me. There were no clouds. Strangely, there was a large crimson cloth flapping in the middle of the sky. The letter 'H' was emblazoned across it. I uttered, "Harvard". What was that dream about? So strange! Why didn't I think of 'H = Hidayah'? Why Harvard? I had not been thinking of Harvard at all. 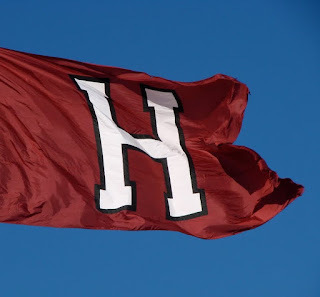 I didn't even know what the Harvard icon or flag or colour was. Maybe when I was in school, I never thought of myself as smart. None of my teachers had ever said that I was good enough to enter the best universities in the world. I called my professor to inform him that I would not be applying for the Masters in Strategic Studies. I apologised for making him write the reference and told him that I needed to rethink my study plans. Harvard came in a dream. I am glad it did. Because it pushed me to aim higher and dream bigger. And ultimately, I got the prestigious Fulbright Scholarship. However, I didn't study at Harvard when I was on the Fulbright. But, that is another story for another day. I figured that it could be like how I created hidayah_in_paris@hotmail.com when I was studying at Sciences-Po Paris.